Tart cranberries and raspberries, sweet blueberries and toasted oats. This granola bar tastes like a luscious berry crumble on a warm summer night. Feel good about choosing Mixed Berries. Berries are full of antioxidants, which are great for your nervous system. 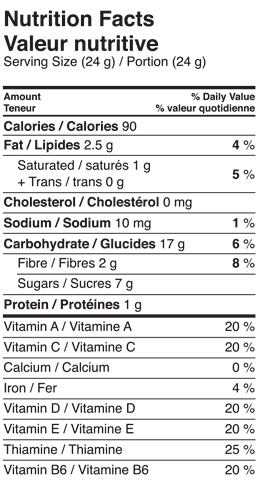 These bars contain oat bran, believed to lower LDL, “bad cholesterol”. They’re also slow to digest, keeping you fuller longer. All MadeGood ingredients are ethically sourced. 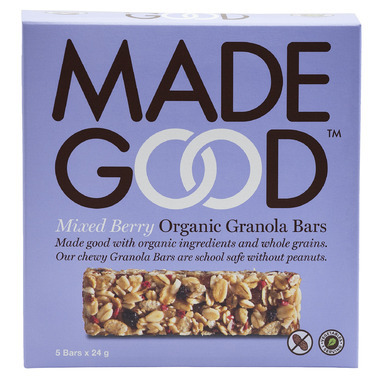 MadeGood Granola Bars are the peanut free organic snack that really hits the spot. Not only do they contain the nutrients in one full serving of vegetables from six different sources, they’re also made from whole grains and are non–GMO verified. These wholesome, delightful bars make the perfect afternoon pick-me-up at school or on the go. Like all made good granola bars these are delicious. You get a tangy berry flavour. I love that they add vegetable powder, are nut free and organic. This is the flavour our family really enjoys!! Great gluten free bar, and so easy to pack for lunches. Made Good bars are definitely a good choice for healthy bars, and the flavours are quite enjoyable! Love these granola bars. Not only are they healthy they taste great! Our family loves all of the Made Good products which are excellent options for a family that has members that have to follow gluten free and peanut free diets. I was soooo excited when I discovered this brand. Finally a granola bar that my kids could actually take to school because everything with nuts has been banned from their schools. I was so disappointed when the bars kept coming back home in their lunch bags with one bite out of them. When I asked them why, they both insisted they just didn't taste good. I LOVE health food. In fact, I live on health food. But I had to be honest with myself - I really didn't like the taste of them either. They taste like cardboard and that is the truth. I'm very surprised that the company seems to have succeeded in getting their bars into so many stores. Somebody must be enjoying them, but we have definitely stopped buying them. Health food just doesn't need to taste that blah. Good size snack for my toddler. Nice to find products with no allergens, as my 2 year old can't have dairy, nuts, egg! Very tasty and nice chewy texture. A little sweet for my taste though (as are most granola bars). My 3 year old loves these though so it's a win for me. I love to enjoy one with my one (and only) coffee of the day; combines a sweet treat without a lot of unhealthy baggage! Great size for kids, small for adults. Nice to have an option that does not have chocolate in it. Chewy, tasty bars with a full serving of vegetables. We liked our first bars so much, we tried all of the flavours. Mixed Berry is tied with Apple Cinnamon for house favourite. My son's school is a nut-free school and I was having the darnest time trying to find a reasonable granola bar that wasn't loaded with chocolate. This was it! It tastes great, it's chewy, and nutritious. The only granola bars we buy. When on sale stock up! Excellent product! They are soft and tasty, perfect size for snacking. Organic and healthy - GREAT! This particular flavour is WAY too sweet. I've tried their other flavours and they're okay, not great. I love the texture though. The bars are tiny (maybe half of a nature valley's bar) and chewy. If you wanna try one of MadeGood's products, go with the chocolate chip one, not this. These are fairly good, BUT, I find it really annoying that the size of these TINY bars is only 3 inches by 1 inch!!!!! Too small for the price I think, and not much of a snack to fill the hunger gaps. There are much better bars out there that are decently healthy and are much larger for the same price. So no, I would not bother buying these again because of the size issue.